Works such as these raise questions about the current phase of the artist’s career. 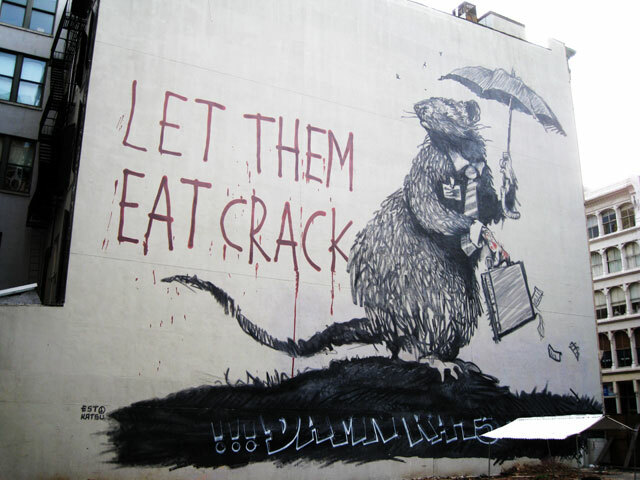 After achieving extremely widespread recognition through guerrilla installations and “culture-jams” such as his infamous museum hunts, Banksy’s most recent work may raise questions as to the potential irony of commercializing street-art culture. Or is the work simply self-promotion in one the capital cities of the street art genre? 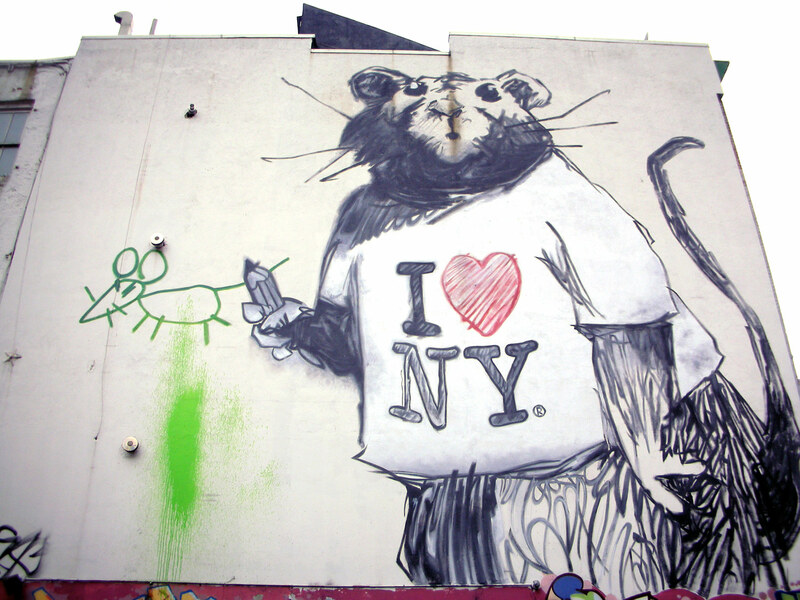 With the graffiti sale flop at the Lyon and Turnbull’s auction on September 27th resulting in many Banksy lots being pulled, is there still a market for such guerrilla art or is Banksy trying to transcend the market and transform himself? 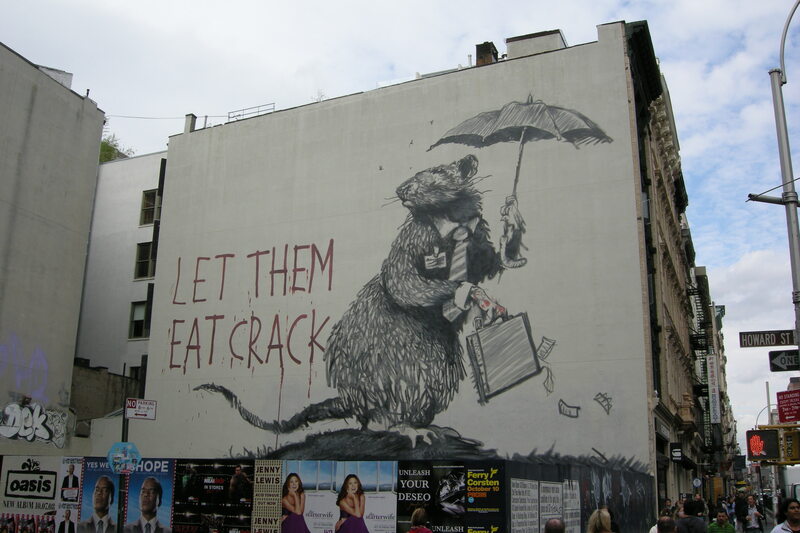 That an underground street artists it cooperating with ad firms to work on large, legally rented spaces is in many ways paradoxical at the very least, and perhaps even more so considering the seeming celebration of ostensibly street-worthy terms such as “crack” juxtaposed with the reference of a businessman as a rat. Having done campaigns for Nike and Diesel in the past months, Colossal Media, in one instance, said their goal was to “reach urban taste-makers in trendy neighborhoods throughout Manhattan and Brooklyn using hand painted wall murals.” Local NYC graffiti artists reacted to the mural by painting “!!! DAMN RATS” in large, legible letters below the mural, though the attempted vindication is not very visible at street level. This entry was posted on Friday, October 3rd, 2008 at 4:42 pm	and is filed under Art News. You can follow any responses to this entry through the RSS 2.0 feed. You can leave a response, or trackback from your own site. I love the REAL spray painted letters saying “!!! DAMN RATS”. 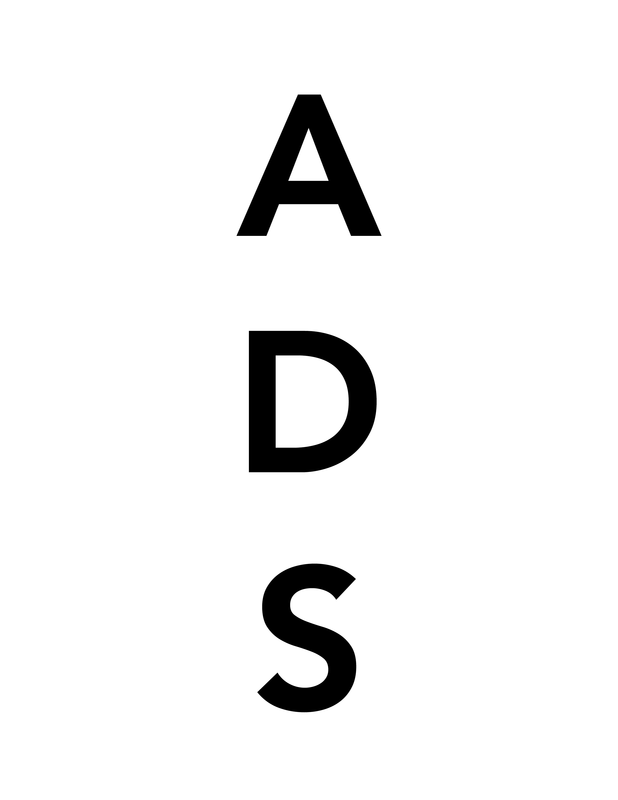 So simple and so clever, simple outline. Quick and effective. by a talented anonymous artist for sure. Cool, the locations of these paintings are here: http://refacement.com/. As a rat owner and artist who draws rats, I have to say these are wonderful! !